During pregnancy, the foods that you eat can directly affect your baby's growth and development. Celery is not bad for you to eat during pregnancy. 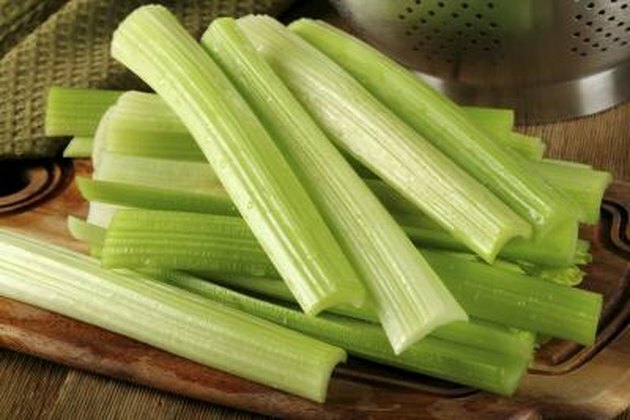 In fact, eating stalks of celery offers many benefits and contributes to your vegetable intake. However, some parts of the celery plant are not safe to consume during pregnancy. Celery is a source of fiber, which can help prevent hemorrhoids and constipation during pregnancy. It can also help you feel full for longer and can help to control your blood sugar, according to Colorado State University Extension. During pregnancy, you need 28 g of fiber a day. One cup of celery contains 1.9 g of fiber, and fiber is also found in fruits, other vegetables, whole grains and nuts. Celery is a healthy snack packed with nutrients including vitamin C, potassium and folic acid. It has a high water content, making it low in fat and calories. Babycenter recommends celery as one of the vegetables you can snack on in order to reach the recommended intake of four to five cups of fruits and vegetables daily during pregnancy. Stay away from celery seeds, which are found in the flowers of the celery plant. According to the University of Maryland Medical Center, celer y seeds can lead to uterine bleeding and contractions in your uterus, which can cause a miscarriage. Celery seed oil is made from distilling the seeds and is used as a sedative. Drugs.com states that the safedosage of celery seed oil is unproven and that it should be avoided. You can try dipping celery in light ranch or vegetable dip to add more flavor. You can also dip celery in hummus or peanut butter to add some protein sources to your snack. Be sure to eat a balanced diet of vegetables to get a variety of different vitamins and minerals in your diet. Talk to your doctor about a healthy diet to follow during your pregnancy if you are unsure of what is best for you and your unborn baby.